Heath Terry at Goldman Sachs has slapped a BUY rating on LinkedIn, an upgrade from the firm’s previous ‘neutral’ rating. It’s raising its price target to $135/share, saying the stock offers 47% upside. Why the optimism on LinkedIn? Goldman’s own proprietary checks are showing strong enterprise adoption. Recruiters love the product, which is cheaper than competitive offerings. The new offerings like Today, Groups, and Mobile are showing strong user engagement. The ‘Hiring Solutions’ business — which is 50% of LinkedIn revenue — grew 156% in 2011. That unit will grow at an average growth rate of 45% over the next five years. At the end of 2011, LinkedIn 145 million registered members, up 60% year over year. That number is now over 150 million, just as of the end of February. International growth is particularly strong, and the opportunity is still huge, with just 4% penetration into the global professional workforce. 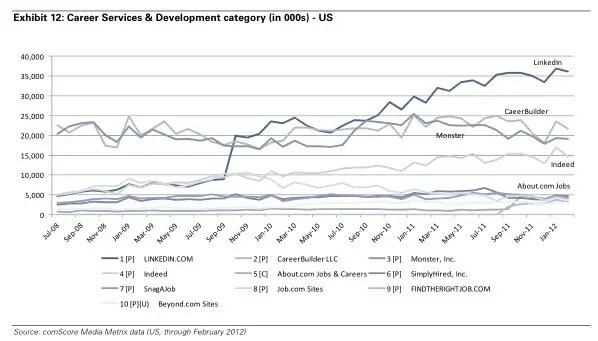 Meanwhile, LinkedIn is gobbling up share in the Career Services space.